Danny at Sussex Police weith PC Laura Marmolejo, Chief Inspector Marc Clothier, Chief Constable Giles York, Mum Fran and Sister Sky. 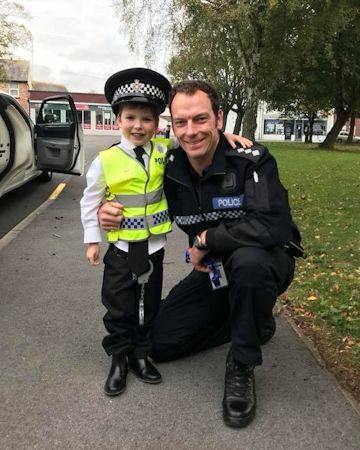 Danny, who has a heart condition, has always wanted to become a policeman. Not letting it stop him from fulfilling his dream, Danny has been serving with Sussex Police since November 2017 in a variety of roles across the force. Chief Inspector Marc Clothier and PC Laura Marmolejo, both of Sussex Police, joined Danny and his mum, Fran, in receiving his Honorary Dispatcher of the Year award at a mini ceremony held at Gatwick Airport on Thursday 23 August. On the day, PC Danny was also invited to join teams from across the emergency services at Gatwick Airport - including the fire and rescue service and some specialist policing teams. 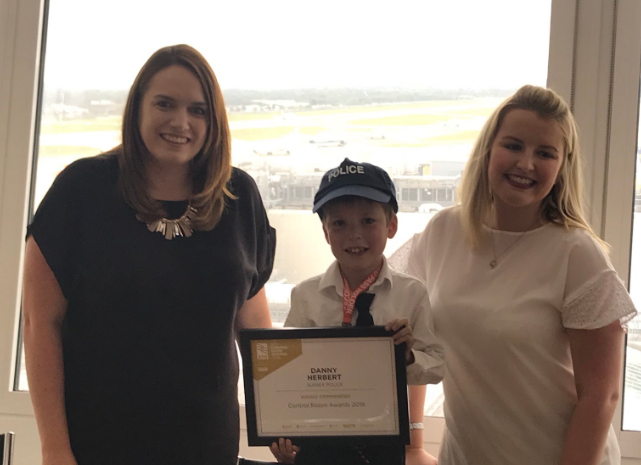 Rhiannon Beeson and Jane Cross of APD Communications, who created the awards, came along to present a framed certificate and prize to Danny which included his own police notepad, stationery and sweets, and a gift voucher to buy some new toys. Danny is the youngest to have been recognised at this national awards event, which was created to celebrate control room staff who play a critical role in the response to emergency incidents day in and day out. PC Danny has worked in the Contact, Command and Control Department, where he met the Head of Department C/Supt Jane Derrick and undertook the role of a Radio Controller in the police control room. He’s also spent time with the Roads Policing Unit where he held a speed gun, and was an officer at Chichester Police Station where he arrested and booked into custody a ‘suspect’ who had been drawing on cars, as well as working with the Dog and Tactical Firearms units. Danny’s condition – Pulmonary Atresia – is an extremely rare birth defect involving the heart and lungs. His pulmonary valve was not formed correctly, meaning blood from the right side of the heart is unable to travel to the lungs to collect oxygen before being pumped around the body. In recognition of his work, and his bravery, Danny’s colleagues at Sussex Police nominated him as the Dispatcher of the Year 2018. The judging panel – formed of senior representatives from across the emergency services – were truly humbled and hugely impressed by Danny’s story. The judges said it was heart-warming to read his nomination, in which it was clear that everyone who had spent time with Danny found him to be a truly inspirational young man. Being recognised in the Control Room Awards, PC Danny was among the very best control room personnel from across the UK – including London Fire Brigade, London Ambulance Service, Police Scotland, North East Ambulance Service and many more. For the full shortlist, click here.